Elana donated $50.00 April 23, 2019 ... "Go, Tara!" Your sis, Tamara donated $20.00 April 22, 2019 ... "Your dedication to this ideal is amazing!" 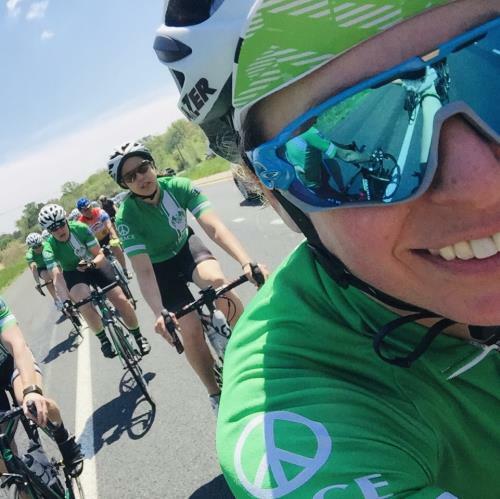 Lucia donated $50.00 April 22, 2019 ... "<3"
I ride with Team 26 for Peace, Hope, and Love. This project chronicles the deaths by gun violence in the US since the shootings at the Sandy Hook elementary school on December 14, 2012. This project took place from March 18 - April 19, 2013. More than 3000 balloons, each with the name, age, and date of death of a shooting victim inside, filled the gallery. During the reception on April 2, 2013, viewers used straight pins to pop all of the balloons. The gallery was left with the detritus of the balloons and names on the floor. New balloons were added in the remaining two weeks of the exhibition as more shooting deaths were recorded. Shelly & Peter Taylor donated $100.00 March 26, 2019 ... "Great cause!" Joel Barbara and Ava Volterra donated $50.00 April 20, 2019 ... "ride on Tara!" Brian Sullivan donated $50.00 April 16, 2019 ... "Happy/sad to chip in a few bucks for this important cause. Thanks for getting out there and making it happen, Tara!" Betsy donated $25.00 April 22, 2019 ... "Happy to help you reach your goal. And thanks for doing this." Sasha donated $25.00 April 17, 2019 ... "Send my love"
Maryanne Caruso donated $20.00 April 15, 2019 ... "Ride safe and thanks for your commitment to this important cause. "